We understand that business insight gained from quality reporting enables your organization to realize its maximum revenue potential. As a result, we invest heavily in service management reporting because we know our customers need the ability to track trends, quantify productivity & operational goals, and identify inefficiencies. ServiceIntelligence™ is a comprehensive set of service management reporting tools that includes powerful ad hoc capability, real-time graphical dashboard displays, industry standard reports, and replicated database options. 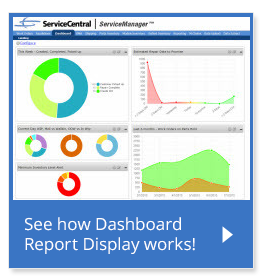 In addition to ServiceManager™ for system administration, ServiceIntelligence™ service management reporting is included in every ServiceCentral implementation and supports the reporting for all ServiceCentral product modules. Build unlimited custom reports quickly and easily; modify as needed and control user access. Schedule report generation and determine delivery options (web/email) and format (pdf, excel, etc.). Define report style and add chart graphics to visually present report data as desired. Graphical interface reports provide real-time snapshots of work in progress, operations, and productivity. Configurable data parameters and chart layout (Pie, Bar, Trend, Plot) for customized views. Drill down capability to see reporting details down to the individual work order or data element. Standard system reports available on customer activity, employee productivity, and product activity. Selectable data parameters and output configurations enable customized output. Export report data for further manipulation.